Spanish writer and philanthropist; born at Madrid; died 1699 at Amsterdam. He went to Venice to escape the persecution of the Inquisition, and thence to Amsterdam. Pereyra was highly esteemed on account of his wealth and culture, and for several years was president of the Spanish-Portuguese community in Amsterdam. He was a warm admirer of Shabbethai Ẓebi, to visit whom he, in company with Isaac Naar, made a journey to Italy. He also wished to go to Gaza to pay homage to the pseudo-Messiah. He donated 46,000 gulden to the Talmud Torah at Amsterdam, and founded the Talmudic seminary at Hebron, in which the physician Meïr (like Pereyra, an adherent of Ẓebi) lived for some time. Of Pereyra's works the following have been published: (1) "La Certeza del Camino," dedicated to Señor Dios de Israel (Amsterdam, 1666). This work, consisting of twelve sections, the fruit of twelve years' labor, contains reflections on Providence, the vanity and emptiness of the world, human misery, love and reverence for God, on virtues and vices, rewards and punishments, etc. (2) "Espejo de la Vanidad del Mundo" (ib. 1671), with sonnets of Isaac Orobio de Castro and Daniel Levi de Barrios. (3) "Discursos Legales Sobre la Verdad de la Ley" and "Livro Que Contem o Termo é Codicoẽs con Que vos Srs. do Mahamad do K. K. de Talmud Tora Admitiraõ o Legado Que nelle Constituiõ Abr. 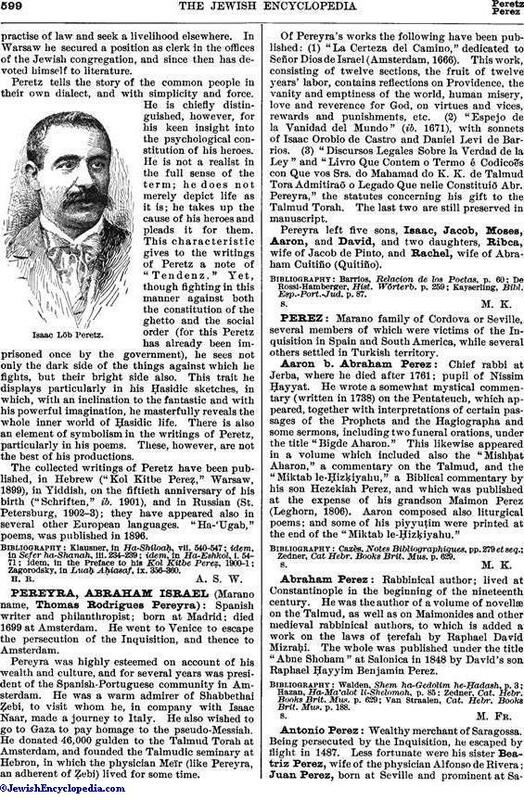 Pereyra," the statutes concerning his gift to the Talmud Torah. The last two are still preserved in manuscript. Pereyra left five sons, Isaac, Jacob, Moses, Aaron, and David, and two daughters, Ribca, wife of Jacob de Pinto, and Rachel, wife of Abraham Cuitiño (Quitiño). Kayserling, Bibl. Esp.-Port.-Jud. p. 87.